I love my son David. He turns 2 at the end of this month, and he’s brought so much joy into our lives. If you meet him, you’d understand. When I first learned we’d be having a son, I had so many hopes for him and for our relationship. Having read so many books on fatherhood while constantly pondering the kind of man and father I longed to be, I was going to father the next great son (aka Jeremy Lin). Just kidding, but sorta true. Now that I’m two years in to the fatherhood journey, it’s been so unbelievably joyful for me. However, it hasn’t been quite what I expected. You see, David loves me, and I totally know that to be true. He gets super excited when I come into his room every morning, and he squeals with delight when I come home each day. He promptly gives hugs and kisses whenever I ask, and we eat breakfast together almost every day reciting memory verses, the Lord’s Prayer, and Toy Story. But compared to my wife Tina, I am second. It’s not even a close second, it’s a distant, unequivocal second. I’m pretty sure if you were to ask David who he wants to play with, 10 times out of 10 he’ll say Tina (unless I’m given an ipad and Tina is left with a Calculus textbook then he might choose me 1 out of 10 times). Tina is an unbelievable mom so it’s not surprising that this is the case, but I’d be lying if I said I expected this dynamic. I thought I’d be my son’s hero and I had every intention of fulfilling his (or my) wish to be exactly that. But if given the choice between me and umma (Korean for mama), David would choose to be with umma and play with umma and read with umma and shoot baskets with umma 10 times out of 10. The sting of this reality cut deep when David couldn’t really talk but his gestures were clear signs of preference. But now that he can easily articulate his wishes with signs and words, the rejection pierces to another level. Having often felt overlooked as the youngest in a family of four and marginalized as a smallish Korean-American growing up the pangs of rejection touches some of my most vulnerable wounds. When triggered, these wounds can set off all sorts of reactions, ranging from overwhelming grief to hurt to anger. To feel this way when it comes to my son hurts more than I thought it would, not so much because it’s different than other feelings but because it was so unexpected when I thought about fatherhood. Of course I’d feel rejected by Tina some, and surely if I had a daughter there’d be things I wouldn’t understand and therefore feel out of place. But my son?? Never would I have expected this. The saddest part for me is my reaction to whenever the feelings of rejection come. Every time he jumps out of my lap when he hears Tina wake up or every time he runs into her arms when he senses danger, a sensor inside my heart erupts with pain. And that pain often leads me to a place I never thought I’d ever go with my son. It takes everything in me (and really, something supernatural) to react a different way. Memories of my own wishes as a child re-emerge – longings to be heard and seen, and held, even though everyone thought I was okay on my own. The battle goes back and forth, rumblings of self-talk zooming through neuropathways jostling for an upper hand. I hope one day these battles will cease. I pray to God that one day these battles will cease. And off he runs back to umma. This came as a short announcement on facebook, but it was so exciting for me to see the release of the song Here’s My Life, written and performed by Craig Okpala, pastor at Hope Church NYC (and produced by the the ever-talented Paul Kim). We’ve been singing this song as a congregation for the past few weeks, and it so aptly captures the heart cry of so many of our people. Many were surprised when they heard it was an original song written by Craig. Craig also shares the story of this song in the sermon below. Powerful. Thank you, friend, for creating music that touches the heart. May it bless many! When we first started Hope Church NYC a little over a year ago, our dream was to begin a movement of churches where honest, diverse communities of people would discover Christ. This Sunday, November 24th, Hope Roosevelt Island (our 2nd church) hosts its first preview service followed by a Thanksgiving Community Dinner. It’s hard to believe this is all happening! Dan & Amanda Sadlier have done an amazing job leading this community, and there are so many unsung heroes who are part of this launch (Jim Bates and so many others). I’m really excited about this Sunday! If you’re free to join us, we’d love your support in helping serve some food. More so, we’d love for you to invite any Roosevelt Islanders you know who are not connected to a church. And above all, we’d appreciate your prayers so that Hope Roosevelt Island can be a true blessing to Roosevelt Island. 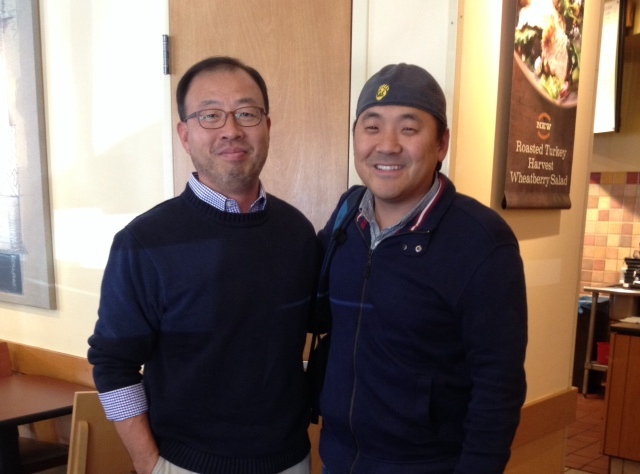 During a recent visit to Nashville, I was able to spend a couple of hours with Paul Lim, a man who has had a significant impact on my life as a professor, pastor, and friend. I’ve learned a lot from this man. My times with him are always enriching… and hilarious. Anyhow, I wanted to take the time to congratulate him for recently receiving the prestigious Bainton Book Prize for his book, Mystery Unveiled: The Crisis of the Trinity in Early Modern England. This review by Scott Clark goes into more detail about the book and its significance. Very cool. 1. Pursuit of Excellence – Whether it was playing Paul in ping pong (he’s amazing) or listening to his theology lectures, I’ve really appreciated the effort Paul puts into whatever he does. Paul’s verve for excellence really shows how much he cares, and as a student who would comb over his well-prepared notes, I really felt like he cared about me by his meticulous preparation. 2. Humility – I think he’d probably laugh at this, but Paul is someone whose humility I really respect. The dude is mad gifted and mad accomplished, but I’ve never met anyone as introspective as him when it comes to the motives of his heart. 3. Being Who I Am – I don’t know how else to explain this, but Paul has taught me a lot about being who I am. Paul models this well, in my opinion. He is unabashedly who he is, and it’s really refreshing to be around. But he’s also been able to point things out about me at different points in my journey that have been helpful in discovering who I truly am… in Christ. I am so grateful for Paul in my life, and I’m excited to see his recent work get recognized (and I can’t wait to see how else God will use him in the future)! No one really cares about these NBA predictions but I’ll make them anyway. I regret not posting this before Opening Night, but please trust me when I say these were my thoughts before the first game (it’s probably easy to point out 1 & 2 come after Opening Night losses by the Bulls and Clips). You’ll notice my predictions are mostly “Who’s Not Good Enough to Make It to the Finals, and then Who’s Gonna Be There in June”. 1. The Chicago Bulls Need Another Scorer And Without One, They’re Not a Contender – I did not watch the game on Tuesday, but I predicted the outcome. I LOVE D-Rose, and he’s easily one of my favorite players to watch besides Kyrie and Lin, but I don’t know who else can carry the load offensively for the Bulls. I can’t see them getting past Indy or Miami. 2. I Don’t Think the Clippers are Contenders – Now, you’re hearing this as a Clipper Fan, and as much as I love the Clips, I think the acquisition of Doc Rivers is overrated. I think he’s a great motivator and recruiter (one of the best), but I don’t think he’s a great game manager, which is what I think the Clips need. I think most of Boston’s success came due to KG’s leadership, so I’m hesitant to say that Rivers’ addition has pushed the Clips into contender status. 3. The Knicks are Exactly Who They Were Last Year – I really don’t know what’s different about them. I think they’ve hit their ceiling, unfortunately. I’d love for them to win just because I think the City would explode, but I can’t see them getting past the first round of the playoffs. 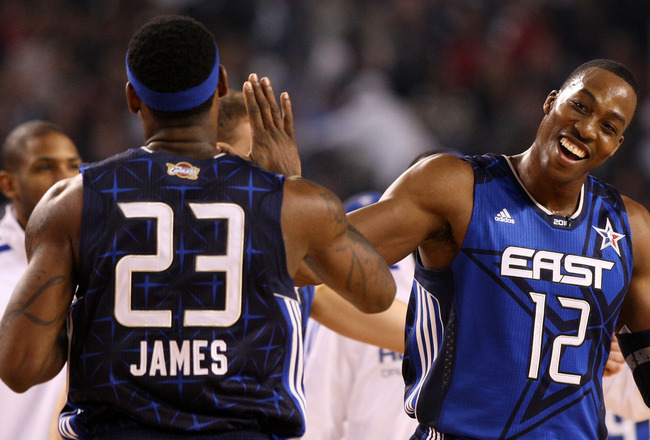 This Year’s Nets remind me of the 2004 Lakers experiment. 4. The Nets are Too Old For a Long Season – The team sorta reminds me of the Lakers in 2004 when Gary Payton and Karl Malone joined the Lakers. 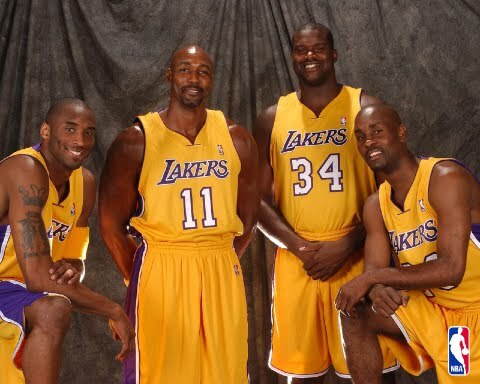 I mean, that team made the Finals, but that was with a Prime Shaq & Kobe. I really want the Nets to do well, but I don’t think they’re anywhere close to the Eastern Conference Finals. I think they’ll be almost even with the Knicks, although I think they’re better than the Knicks. 5. I Think OKC has peaked and Will Not Make it to the Western Conference Finals – KD is amazing, and he’s inching toward Lebron-status, but I can’t see how they’ve gotten better when it comes to the top teams in the league. 6. Golden State is a Wild Card for Representing the Western Conference, but they’re not Big Enough – I love Mark Jackson as a coach. I don’t think they match up well with SA or Houston, though, and they kind of remind me of the D’Antoni Phoenix Suns – really fun to watch with all their perimeter scoring, but not enough punch inside. Steph Curry could just carry them, but I don’t know if they’re small-ball can be as overwhelming as SA & Houston. 7. Indiana’s Scary Good, and My Dark Horse to Win It All – In a seven game series, these guys are scary good. Just for them, I could see the Heat trying to move Bosh for Asik. It seems like Indiana knows it was so close to beating the Heat, and they reloaded with way more depth and size while Miami stayed virtually the same. 8. The Houston Rockets will square off with the Miami Heat in the NBA Finals – I actually think Houston, San Antonio, & OKC are the best teams in the West, and I think Houston has more young talent than SA and more depth/versatility than OKC. In the East, I think it’s a two dog race between Miami and Indiana. Honestly, I think this might be Indiana’s time, but yeah, I’m actually pulling for Lebron to reach mythical status (see below). 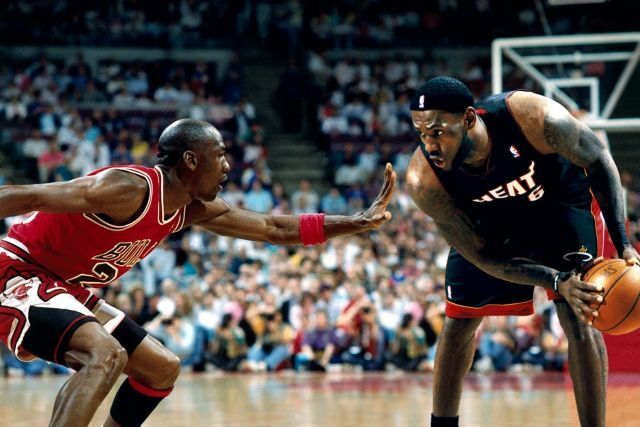 This is a pivotal year in the Jordan-Lebron debate. 9. This is the Season That Defines Lebron’s Status vs. Jordan – So many teams have improved over the offseason (Bulls, Nets, Pacers), and Miami has essentially stayed the same while relying on the greatness of Lebron (and the health and spring of guys like Wade and Greg Oden). If Lebron can hold off Indiana et al in the East and beat whoever comes for him in the West, I think he moves up to 2nd Greatest of All Time. If he loses, I think he stops being compared to Jordan and falls back into Magic/Bird territory. With this said, I’m rooting for Lebron. Why do I love Lebron so much? My brother Peter has written these great pieces on Lebron here and here, and I couldn’t agree more. 10. Lastly, this wouldn’t be a post about the NBA from me without my requisite take on Jeremy Lin – Jeremy will be vastly improved this year, and although he’ll put up similar numbers, those numbers will be way more efficient. I don’t mind if he starts or comes off the bench because I know he’s going to get quality minutes. He’ll be an X factor on an NBA Championship contender, and I couldn’t be more excited for him this season!